There is a lot of pressure on parents to pick the perfect stroller—one that is safe, easy to maneuver, and not too heavy. However, it can be even harder for parents who need a triple stroller and special accommodations for multiple children. Whether you were blessed with three at once or have twins and a toddler, a triple stroller is a must for a mom of three young children. Choosing the right stroller can mean the difference between convenience and difficulty—that’s why we are here to help you by showcasing some of our favorites. Read on and learn about a few different types of strollers as well as the pros and cons to each. 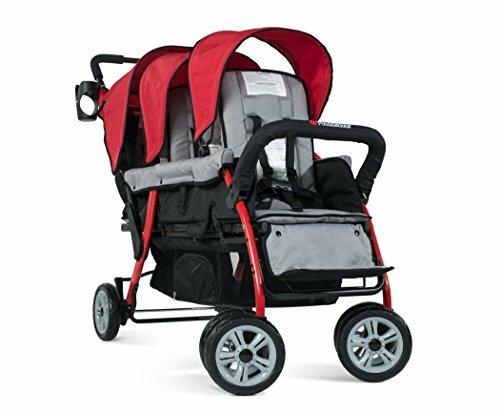 7.0.1 Q: What type of triple stroller is best for me? 7.0.2 Q: How important is it to have adjustability in my triple stroller? 7.0.3 Q: What can I do if my stroller does not have enough storage space? 7.0.4 Q: I already have a double stroller and am expecting a third child. Can I still use this in some way? 7.0.5 Q: How important is the quality of the canopy? Will it protect against rain or other weather? Moms of three need a sturdy stroller if they’re going to be pushing around a trio of little ones. 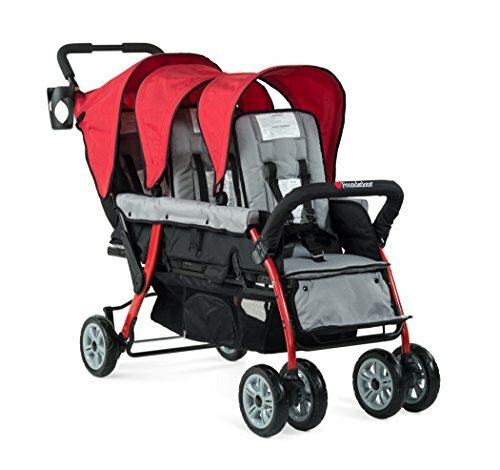 The Foundations Trio Sport Triple Tandem Stroller is an excellent choice because each seat is made to accommodate up to 40 pounds. With a lightweight frame and ergonomic handles, this stroller is designed to maneuver well despite the fact that there will be three bodies in it at once. The wheels also make it easier to handle, made from heavy-duty rubberized foam. Because they are made from this material, the wheels give your kids a smooth, comfortable ride that absorbs shock and lessens the effects of bumps. Each seat features its own canopy that shields the riders from weather and harmful UV rays. The front and back seats both recline, while as a mom you get the convenience of a built-in cup holder and an under-seat storage basket. Designed for use from birth to about 45 pounds, the Peg Perego Triplette Piroet Stroller is a unique triple stroller that offers versatility and comfort. With each individual seat, you get a canopy with a mesh hole that lets you check on your babies. Each of these hoods is adjustable and feature a place to hang toys. The included seats have three different reclining positions along with adjustable footrests, giving you the variety you need when you have three different infants. 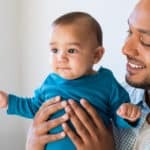 A secure harness keeps your babies safe in place while also allow a little bit of movement, so your baby can wiggle around. Perhaps one of the most unique things about this stroller is its handle. Rather than one straight handlebar to push, this stroller has something more akin to a steering wheel that lets you easily maneuver this large carrier. When you purchase this stroller, you have a couple of different options. You can bundle it all together and buy the stroller with the built-in seats as a package, or you can choose to buy the compatible car seats instead. The latter option costs more money, but in the end, saves you from buying both a stroller and car seats. Not only is Child Craft a long-time trusted name in nursery accessories, but they have developed their Sport Multi-Child Triple Stroller to be safe and convenient, giving moms peace of mind and ease of use. Each of the three reclining seats on this stroller is made from easy-to-clean fabric and feature individual, adjustable canopies. The extra-large storage basket under the seats is designed to maximize storage space. With rubber, shock-absorbing wheels, you can give your children a smooth, comfortable ride—even over rough terrain. At the same time, the seats are designed to align like stadium seats, which gives each of your children the best view possible. One of our favorite parts about this stroller is the safety. For one, the harnesses buckle at five points and are very adjustable. And secondly, the handle is equipped with a safe-break system so that when mom releases it, the stroller stops. Rather than having three seats, some triple strollers instead have two seats and a stand- or sit-on platform on the back. That is how the Joovy Big Caboose Stand-On Triple Stroller functions. Great for moms with infant twins and a toddler, this stroller’s seats accommodate babies up to 40 pounds as well as children 2 and a half years or older. This stroller is a great way to get your toddler involved, letting them stand on the rear platform, sit on the bench, or walk alongside you. Each of the two seats come with car seat adaptors so you can transfer your babies in and out of your car easily. They are also adjustable and include footrests and child trays for snacks and drinks. A reliable parking brake keeps the whole ride in place, letting you pause to check on your kids or use the large storage basket underneath. If you’re looking for a simple, hassle-free triple stroller, you may consider the Obaby Mercury Triple Stroller. Unlike the other strollers we’ve looked at in this review, this stroller features side-by-side seating rather than in a straight row. The simple design is lightweight and not at all complicated. It folds down to a very reasonable size, making it useful for any car. Although it looks slim, it’s sturdy and reliable. The seats of this stroller have multiple recline positions as well as individual canopies for shade. The five-point harness system ensures your babies are strapped in safely and securely with regards for comfort as well. In addition, each child gets their own footrest. Under each seat is a separate storage basket, making it easy for you to access as well as organize by child. As a mom of three, you already have a pretty tough job. A stroller should make your life easier, not more frustrating. So, what should your triple stroller do for you? What can you expect when you start shopping around? 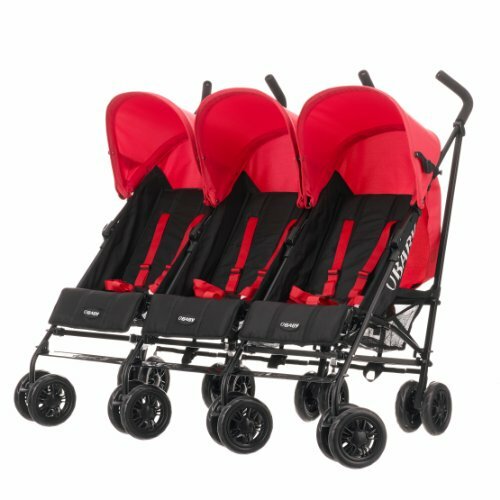 Regardless of their types, triple strollers all have one thing in common: they are designed to hold three children simultaneously. There are triple strollers with standing platforms and triple passenger strollers—one with tandem seating and one with side-by-side seating. So, if there are three different types, what are the differences? Triple strollers with standing platforms are double strollers that are equipped with a platform and a bench on the back just under the handlebars. These kinds of strollers are made so that two babies can sit up front while a toddler sits or stands at the back. Not all moms of three have triplets—some have twins and a toddler. With this kind of stroller, a toddler can walk alongside but still sit or stand if they get tired. Tandem triple strollers frequently use “stadium seating” and are designed with three seats right in a row, one behind another. These kinds of strollers often use the stadium seating method to give the children in the back a better view. These kinds of strollers are great for triplets or young children who are very close in age. They let you push all three at once while still fitting through doorways and walking in stores without taking up the whole aisle. Side-by-side triple strollers have three seats like the latter type, but instead of straight behind one another, these seats are in a row next to each other. These kinds of strollers let each child have a perfect view of what’s in front of them and leave them with open space, rather than being cramped with no foot room. Side-by-side strollers are also often easier to maneuver because you aren’t dealing with as large of a turning radius. Baskets on these strollers are usually much more accessible as well, and the smaller size is easier to fit into cars. After you determine which type of triple stroller is best for you, you should consider specific features that are important to your lifestyle and suit your needs. It’s important to remember here that you can’t be too picky when it comes to this feature. It may be helpful to say right here and now that if you’re purchasing a triple stroller, odds are it is going to be large and heavy—there’s not too much wiggle room here. However, you will find that some strollers are a bit more manageable than others, so if this is really important to you, you should check out the specific weight and sizes of each stroller you look at. A triple stroller under 50 pounds is a gift that should not be underappreciated. Additionally, look at the way it folds up. Some strollers will fold flatters or smaller than others, making it easier to fit into your car or store in your home. The versatility and adjustability of your stroller are important, but in this case, we are talking about the individual seating. Each one of your children is likely going to have different needs at different times. It’s vital that each seat has adjustable reclining as well as movable canopies. Adjustable harnesses are also important, as your children will grow differently too. Harnesses are not one size fits all, so you should be able to keep each child snug, safe, and comfortable at their own growth rates. Although not necessary, it’s nice to have individual trays and adjustable footrests for each seat as well. Strollers are not cheap, and if you have done any kind of research on triple strollers, you know that they are even less cheap than single strollers. By that fact alone, you should be looking to invest in a durable stroller that will last you a long time. Your stroller should be reliable enough to carry three children at once without breaking, bending, or tearing. Not only is this a matter of safety, but it’s a matter of expenses as well. In addition, strollers that grow with your baby are the best. Many strollers are built to accommodate your baby from infancy to 40+ pounds. However, some cannot be used in the early stages of life and are not strong enough to carry three 40+ children. It’s smart to take note of the weight or age range of a stroller to see if it’s really worth the cost. How easy or hard a stroller is to handle is vital to all parents but pushing three kids at once is a challenging task. Look for strollers that are going to make this effort as simple as possible. A good thing to look for is swivel front wheels. Swivel wheels move the easiest when you are trying to turn. Take note of handle types as well. Pushing all that weight can be tough on your, so padded handles are awesome. Some higher-end triple strollers will even feature more of a steering wheel than a handle, which can make turning a lot easier. A good brake system will make your life simpler, too. We recommend finding a stroller that has both front and rear brakes as well as parking brakes. Some strollers have a handbrake right on the handles while others have a foot brake. Either way, you want brakes that are secure. While a small storage basket may be enough for one child, consider the fact that you will have three with you at all times. This requires extra storage, so make sure you look into the types of storage included on your triple stroller. Many moms find it difficult to access the storage basket on a triple stroller. While they usually include a large basket that runs the length of the stroller, it can be hard to reach down under your three kids—especially to the middle. If this kind of storage works for you, that’s great! If not, you may want to consider trying an additional stroller organizer to attach to the handles. The triple strollers we have discussed in this article all have their strengths and weaknesses. You have learned about the products, but what about the companies who made these items? For your peace of mind, we would like to share a little more information about the creators of these children products. 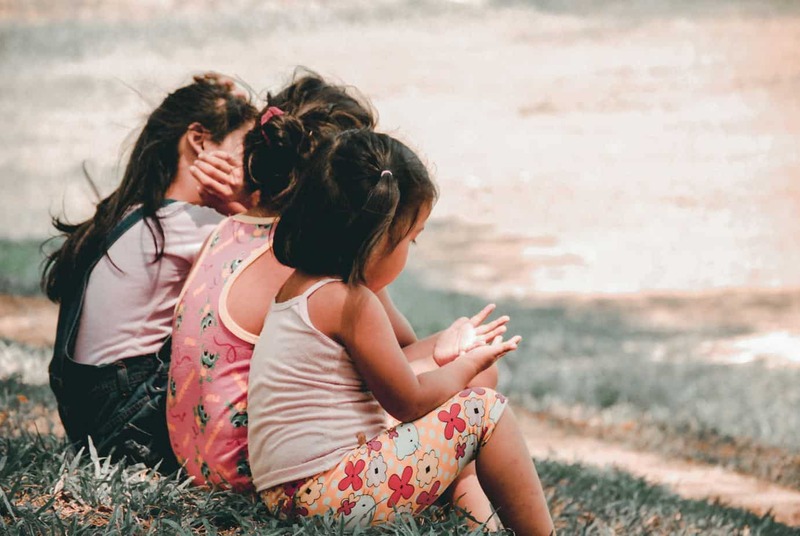 Our first company, Foundations Worldwide, Inc., is based in Medina, Ohio and is the leading supplier of children’s furnishings to professional childcare centers. Perhaps you recognize their name most as the leading manufacturer of wall-mounted baby changing stations in public facilities. This company has been leading the industry since 1954. Peg Perego is a family-owned company that has been up, running, and successful since 1949. They specialize in children’s ride-on vehicles and baby items with the goal of bringing joy, comfort, and safety to families. Another trusted company that’s been around for a long time, Child Craft has aimed at bringing safety, comfort, and style to American families since 1954. Not only do they design nursery furnishings to be stylish and functional, but they want to make them last—long enough to share with future generations. The Joovy company thrives on the motto, “built for family, designed for life.” With a fun and playful tone, this team boasts the fact that they have shed the corporate shell and strive to put themselves in the shoes of parents—staying down to earth and designing family products with quality in mind. A United Kingdom-based company, Obaby offers quality, stylish furniture ranging from cribs, beds, and toy boxes to strollers, changing units, and wardrobes. Along with their fashionable designs, they boast a five-year hassle-free guarantee with standards of elegance, style, and quality since 2002. Q: What type of triple stroller is best for me? A: To answer this question, the first thing you need to ask yourself is: What are the age ranges of my children? Do you intend on taking your babies to public, indoor places like grocery stores or malls? Would you prefer a stroller that allows you to load your babies inside your house? Do you prefer your babies have a full-frontal view at all times? Are you concerned about accessing storage? Are you worried about maneuverability? If you answered yes to these questions, you would probably do best with a side-by-side stroller. Of course, if you’re not a mom with triplets but instead have a toddler and two small infants, a triple standing stroller might be a good choice for you. With the standing stroller, your toddler has the freedom to walk alongside you but can also stand or sit on the bench just under your handlebar. Q: How important is it to have adjustability in my triple stroller? Additionally, other features on your triple stroller should be adjustable as well. You should always have adjustable harnesses, so you can secure your baby snuggly as they grow. It’s wise to have adjustable footrests for the same reason. Also, adjustable canopies are great for protecting your baby from harmful UV rays, and adjustable handles are great when the height of the stroller does not necessarily accommodate your height. Q: What can I do if my stroller does not have enough storage space? A: Storage space is a common issue found with strollers of all kinds, especially triple strollers. Luckily, there are options for adding more storage space. The best way to do this is to purchase a stroller organizer. Stroller organizers attach to the handles of your stroller and offer additional space to put important personal or childcare items. They come in all different shapes, sizes, and styles, so there is certainly one that will suit your needs. Stroller organizers also often have cup holders, key holders, and other features that are convenient for you, not just for your baby’s things. Some moms prefer stroller organizers over stroller baskets anyway because they provide many more options in terms of organization. With a basket, everything gets thrown into one large area. With a stroller organizer, you have several pockets and compartments with zippers and Velcro, so you know where everything is at all times. Q: I already have a double stroller and am expecting a third child. Can I still use this in some way? A: Yes! You can actually buy an attachment for a double stroller to add a third seat to the front. Some companies call this a joey seat. The attachment allows you to put the joey seat in front of and above the existing two seats. Using this product, you don’t have to buy a brand-new triple stroller to accommodate your growing family. Q: How important is the quality of the canopy? Will it protect against rain or other weather? A: We recommend getting a stroller with a canopy that is not so thin that it will rip easily. You will be bringing your stroller everywhere, as well as folding it up and storing it in your home, garage, car, etc. With all that moving around, there’s a good chance damage can occur. If you have a canopy made from quality material, you have a lesser chance of ripping it. Additionally, some canopies are UV ray resistant. This is highly important because having a UV resistant canopy can mean the difference between your baby getting sunburn/sun poisoning or staying safe. Not only should your canopy protect and shield your baby, but it should be adjustable so you can move it as the sun moves. Canopies are not necessarily the same thing as a rain cover. Some strollers come with a rain cover, and others do not. You should check for those specifics before you buy the stroller. If yours does not have a rain cover, we recommend investing in one. You can also find winter covers that protect your baby from the cold. These are very useful in the fall, winter, and early spring and will help keep your baby warm. They are usually sold to cover individual seats, so you would have to purchase three for your triple stroller. When it comes to our favorite, it was hard to choose given that there are so many different kinds of triple strollers. For that reason, we have chosen not one, but two favorites in different categories. 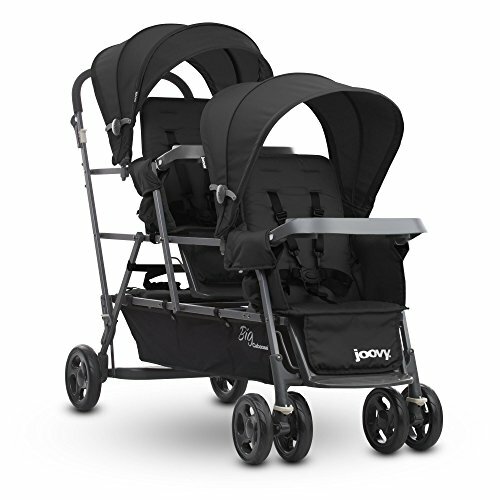 The first of our favorites is the Joovy Big Caboose Stand-On Triple Stroller. Being a mom of three does not necessarily mean you have triplets, and this stroller makes it easy and fun for a toddler to be in the picture. With this stand-on stroller, your toddler can walk around on his own, or he can choose to sit or stand on the platform and bench on the back of the stroller. It’s much easier for you to keep track of him while still keeping a close eye on your babies in their seats. This particular stroller accommodates the proper amount of weight while remaining fairly well-maneuverable. We also love the fact that it comes with a car seat adapter so that you can use virtually any car seat with this stroller. That makes getting your babies from car to stroller that much easier. Folding almost flat, it’s hard to find a triple stroller that stores like this one. Even though it’s still large (what triple stroller isn’t?) it certainly folds well. 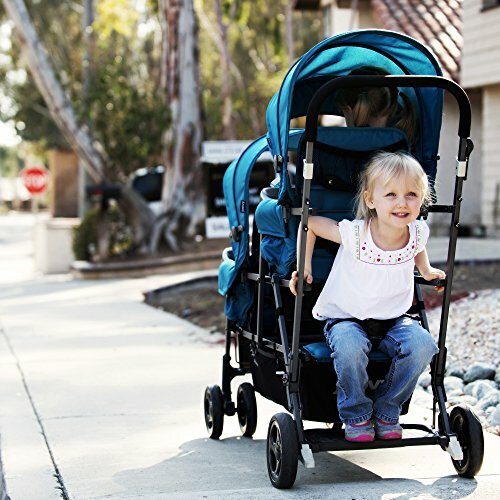 You can purchase the Joovy Big Caboose Stand-On Triple Stroller here. 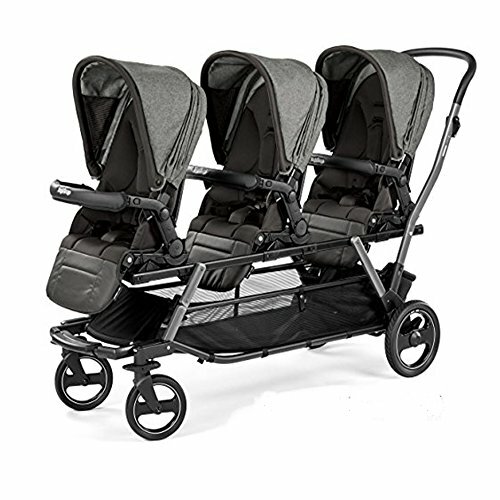 We decided we should also pick a favorite from the three-passenger triple stroller category, as many moms who are looking for triple strollers actually have triplets. 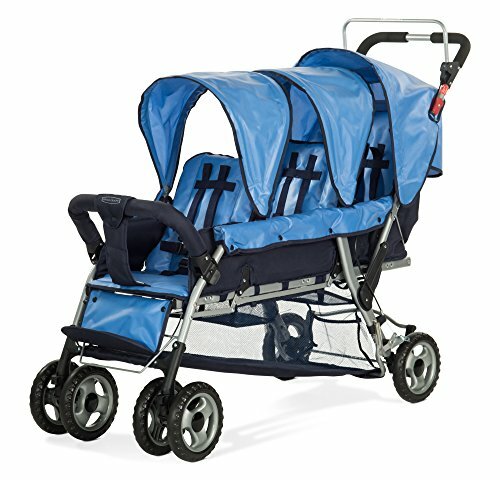 Our favorite from this section is the Obaby Mercury Triple Stroller. We are big fans of the side-by-side stroller. Not only is it functional, but you have to admit the three babies sitting in a row is pretty cute. The Obaby triple stroller lets you easily access all three babies while also giving them each a clear view of what is in front of them. This stroller is a lot lighter than any of the other strollers we talked about, making it much easy to maneuver. In addition, the swivel wheels and wide design make it easier to push and steer. Foam grip handles add comfort for mom, while padded should give comfort to the babies. We also found that the storage on this stroller is much more convenient than on the tandem strollers we reviewed. Each seat features its own storage basket right underneath, making them more accessible to you. In fact, you can even organize your items better, storing each baby’s personal things in their own basket. At a good price, a nice style, and sturdy, lightweight design, we couldn’t go on without singling out this product. 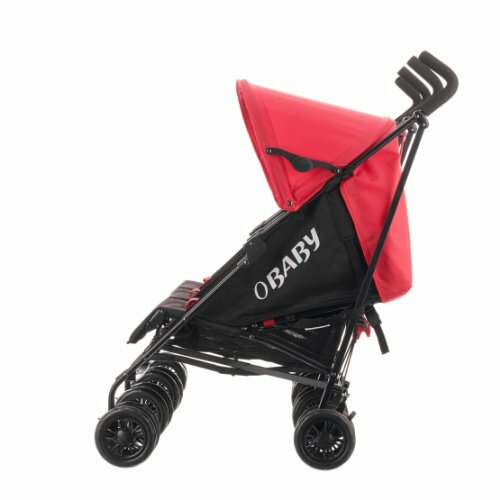 You can buy the Obaby Mercury Triple Stroller here.